Last night we watched Disney Pixar's COCO for the first time, and "Wow!" it was amazing. As soon as the movie starting playing we could tell that this was going to be another Disney Pixar winner, and that it was. Did you see Coco when it was in theaters. Like so many other must see movies we had on our 2017 in theater watch list, this is one movie we hoped to see, but missed due to illness. So, I made a point to mark the DVD/Blu-Ray release on the calendar in 2018 so that we could pick up the movie when it hit stores shelves to enjoy as a family. But, thanks to the folks at Walt Disney Studios, they made my girls' day the other day when Coco arrived on our doorstep to watch. They also offered to give one lucky Inspired by Savannah reader the chance to win a digital copy of this movie, so be sure you read on to learn how to enter my giveaway for your chance to win this wonderful family-friendly movie to enjoy with your family soon. Even though my girls are of Latin descent -- my husband is from El Salvador, they could relate to some of what they saw in the movie, as Miguel's skin color was brown like theirs, and he and his family spoke Spanish words they could understand. We have also studied Dia de los Muertos in homeschool as my husband's family used to celebrate this every Nov. 2nd when he lived in his country. I really liked seeing how the families in the film honored their ancestors by preparing shrines with their ancestors photos and candles, and how they threw a party to honor them, as well as visit the cemetery to bring offerings. This is all we talked about in school and how my husband has described Dia de los Muertos to my girls, so it was nice to see it played out like this in the movie. If you cry easily at movies, especially Disney Pixar ones, then you will want to have a box of tissues handy. My youngest daughter and I always try -- even at happy moments -- and we found ourselves reaching for tissues to wipe our noses and dab our eyes. I will not spoil the ending, but will say that if you haven't cried throughout the movie, the final scenes will have you crying like a baby. But, then the movie ends and you can't help but smile as you realize you sat and watched a beautifully made movie that does a great job at honoring Mexican history and heritage, and love how Miguel's journey ends. 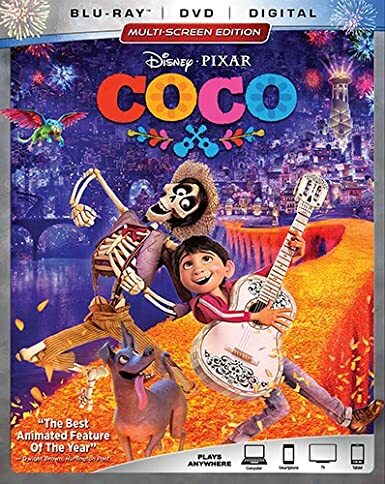 I could go on and on about how great the Coco movie, or how entertaining the bonus content is, but I am guessing you have already seen this movie, or have heard family and friends rave about and are waiting for Tuesday to get here so that you can pick up at the store, and plan a fun family movie night. To make it more fun, why not consider printing off some fun Coco coloring and activity sheets -- just do a Google search and you will find a lot of great free printables to download and share with your child, as you prep a fun Mexican-themed dinner to enjoy before you sit for this fun-filled movie. "Disney•Pixar’s “Coco” —the story of a 12-year-old aspiring musician’s extraordinary journey to the magical land of his ancestors—won a 2018 Golden Globe AwardÒ for Best Animated Motion Picture, topped the domestic box office Thanksgiving holiday weekend, became the highest grossing film of all time in Mexico, broke records in China and earned widespread praise, receiving 96 percent from critics and 97 percent from audiences on Rotten Tomatoes. Now this vibrant tale filled with love and laughter arrives home Digitally in HD and 4K Ultra HD™ and on Movies Anywhere on Feb. 13, and on 4K Ultra HD,™ Blu-ray,™ DVD and On-Demand on Feb. 27.
o Día de los Muertos - In this musical extravaganza, the colors and excitement of Día de los Muertos come to life as we meet superstar Ernesto de la Cruz. o The Way of the Riveras - A musical number in which Abuelita and Miguel prepare their Día de los Muertos celebration while she teaches him Rivera family history and traditions. o Celebrity Tour - Héctor, a Land of the Dead tour bus guide, agrees to help Miguel, revealed to be a living boy, on his quest to find de la Cruz. o The Bus Escape - The Rivera family catches up to Miguel and Héctor and attempts to halt their mission to find de la Cruz. o Alebrije Attack - Miguel and Héctor are interrupted on their journey to find de la Cruz by a fierce alebrije. o The Family Fix - After de la Cruz reveals his true colors, the Rivera family puts their dismay aside and comes together to repair the smashed guitar needed to send Miguel home. o To the Bridge - As the Land of the Dead counts down to the end of Día de los Muertos, Miguel and de la Cruz come head-to-head on the marigold bridge. · Paths to Pixar: “Coco” - Explore how the film crew’s personal stories resonate with the themes of the movie itself. · Welcome to the Fiesta - A musical exploration of the skeletons that make the Land of the Dead in “Coco” so wondrous and intriguing. · How to Draw a Skeleton - Pixar artist Daniel Arriaga gives a lesson on the quick and easy way to draw skeletons using simple shapes. · A Thousand Pictures a Day - Join the “Coco” crew on an immersive travelogue through Mexico, visiting families, artisans, cemeteries, and small villages during the Día de los Muertos holiday. · Mi Familia - Developing the Riveras was a labor of love that took the cast and crew on a deep dive into the meaning of family. · Dante - How the crew fell in love with the uniquely Mexican breed of Xoloitzcuintli (or “Xolo”) dogs that inspired Dante. · How to Make Papel Picado - Join Pixar artist Ana Ramírez González as we learn how papel picado is made traditionally, and then try your own approach to this beautiful art form. Directed by Lee Unkrich (“Toy Story 3”) and co-directed by Adrian Molina (story artist “Monsters University”) from a script by Molina and Matthew Aldrich (“Spinning Man”). Darla K. Anderson (“Toy Story 3”) produces, and John Lasseter is executive producer. “Coco” features an original score from Oscar®-winning composer Michael Giacchino (“Up,” “Rogue One”), a song by Oscar winners Kristen Anderson-Lopez and Robert Lopez (“Frozen”), and additional songs co-written by Germaine Franco (“Dope,” “Shovel Buddies”) and Molina. Also part of the team is musical consultant Camilo Lara of the music project Mexican Institute of Sound, as well as cultural consultants Lalo Alcaraz, Marcela Davison Avilés and Octavio Solis." As promised, the kind folks at Walt Disney Studios are offering one lucky Inspired by Savannah reader the chance to win a digital copy of Coco to enjoy with their family.